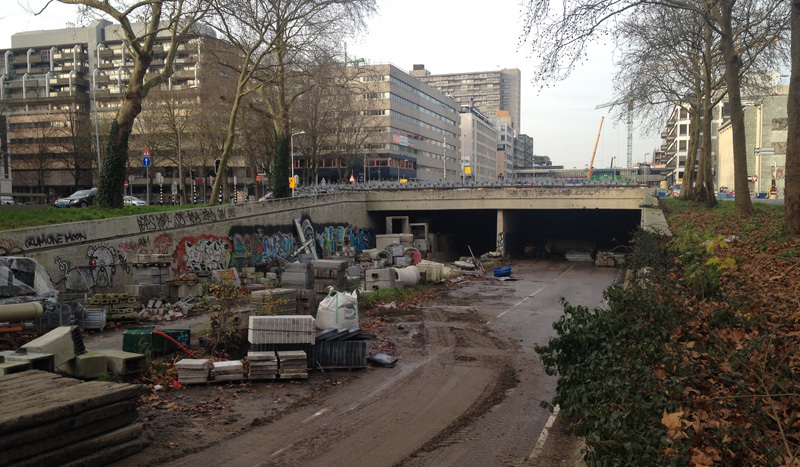 It had been a motorway for over four decades, but now Utrecht has its old city-moat back! What better way to start the new year than with this new beginning for Utrecht? The “motorway from nothing to nowhere”, which was finished in the mid-1970s, still had 11 lanes when it was closed early 2010. 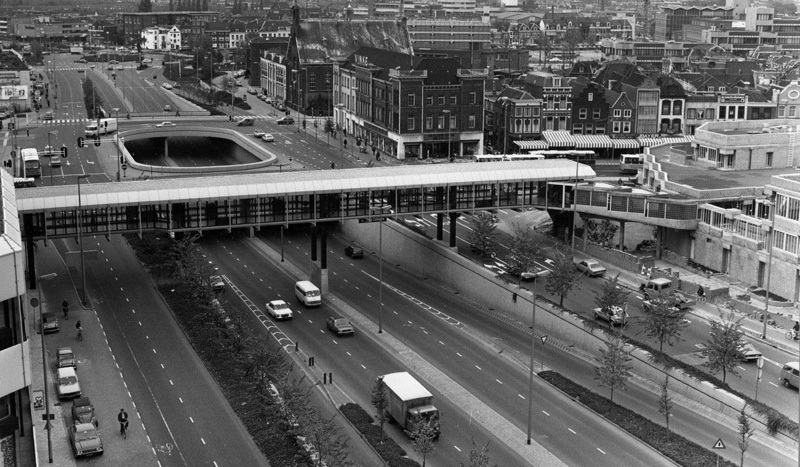 While most Dutch cities (and that includes Utrecht) have a car-free city centre now, Utrecht also had a ridiculous motorway right in its heart, at the point where the old city centre met the modern heart around the central railway station. No longer! Everything has changed back to how things were for well over 800 years. So what is the story here? 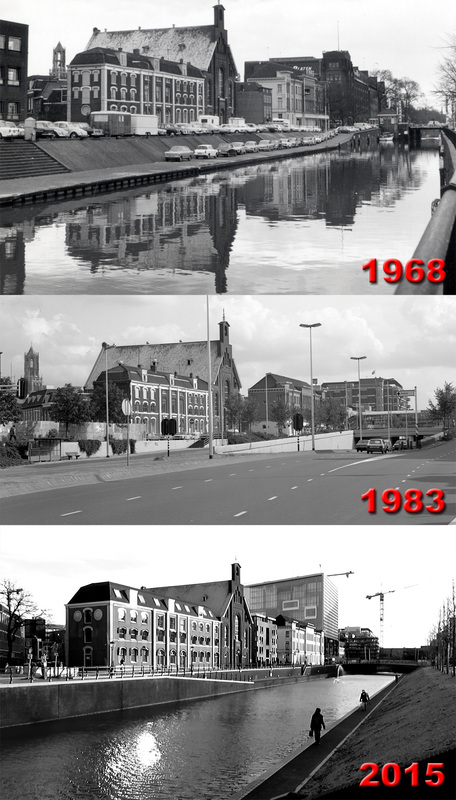 The story of the Utrecht city centre motorway summed up in three pictures. Utrecht was granted city rights in 1122 and it built a city wall with a moat dug around it soon after that year. The moat was fed with water by changing the course of branches of the rivers Rhine and Vecht. The wall served a purpose for about 700 years, but in the early 19th century the ramparts were no longer needed and the wall was taken down from 1830 to 1872. The South and East side of the former city wall was turned into a beautiful city park in English landscape style. The water was incorporated into the park design, as were some remains of the old wall as a ‘romantic ruin’. But the North-West part of the city was bustling with activity. There was no space for a park there. The city port was there and where the walls came down, this part of the city moat got quays for ships to dock. Supplies for many factories were delivered here and many products were shipped out of the city from here. At the beginning of the 20th century that had changed yet again. The port had been relocated to an area in the outskirts of the growing city and land traffic, especially motor traffic, had increased a lot. Left: map of the Utrecht city centre in 1831. The old city moat is still intact. You can see that the East and South part have a lot of green of the then to be developed new parks. The North and West part became industrial zones. Right: a map showing which parts of the moat had been removed and the years they returned or will return. 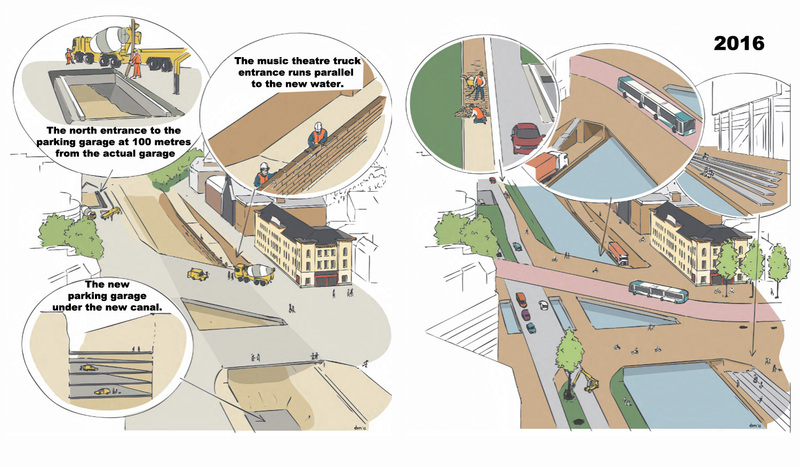 For the last (red) part the city of Utrecht still needs to find funds. 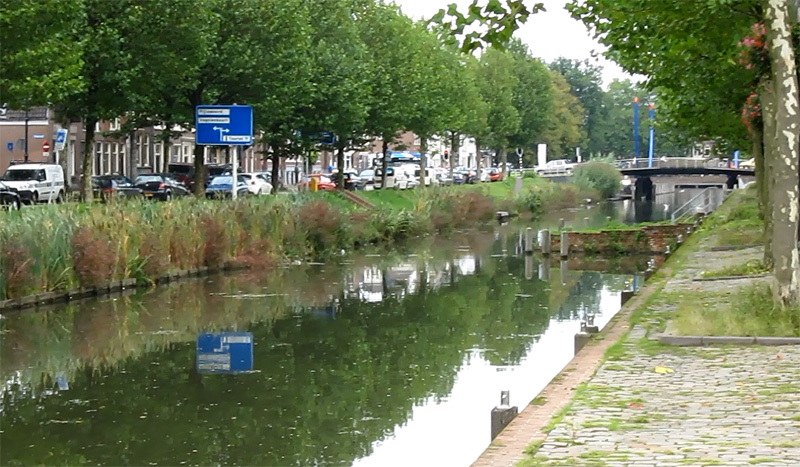 By the 1950s it had become customary in the Netherlands to fill in unused waterways to make way for motor traffic. In Amsterdam a number of the canals and even Damrak had been partly filled in, already in the 1930s. 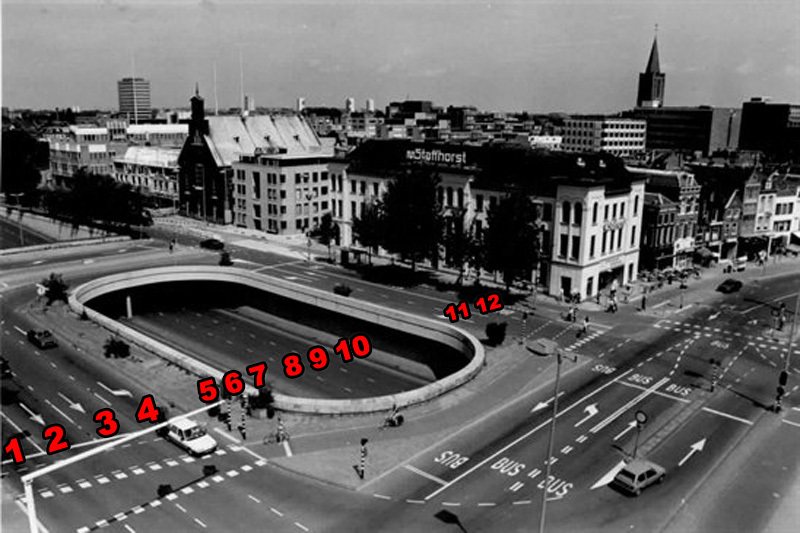 In the late 1950s Utrecht hired a German engineer who proposed to fill in the entire city moat, to use its space for a 4-lane ring road all around the historic city centre. The council, eager to modernise the city looking at American cities as an example, agreed right away, but already at that time this led to fierce opposition from large parts of the general public. The opposition lobbied the national Government successfully. In 1966 the first female minister of the Netherlands, Marga Klompé, decided that the beautiful East and South part of the former moat got the protected status of a monument. Something she could do as minister of Culture. The quays of the North and West side were considered less valuable and so the city decided to go ahead with turning that part of the canal into a motorway anyway. Its construction started from 1968 and the motorway was opened in stages from 1973. For reasons of water management the river-fed canal could not simply be filled in. The water had to be diverted into a giant underground pipe at the shore. Had the original plans from the German engineer Feuchtinger from 1958 been built, the historic city centre of Utrecht would have been totally destroyed. Only the North-West corner of these plans became a reality but the situation was now reversed to the original state. Pictured: two stages of the original plan. Because it was so short and connected to nothing, the motorway was pretty useless. You could drive the full length of it in one minute. 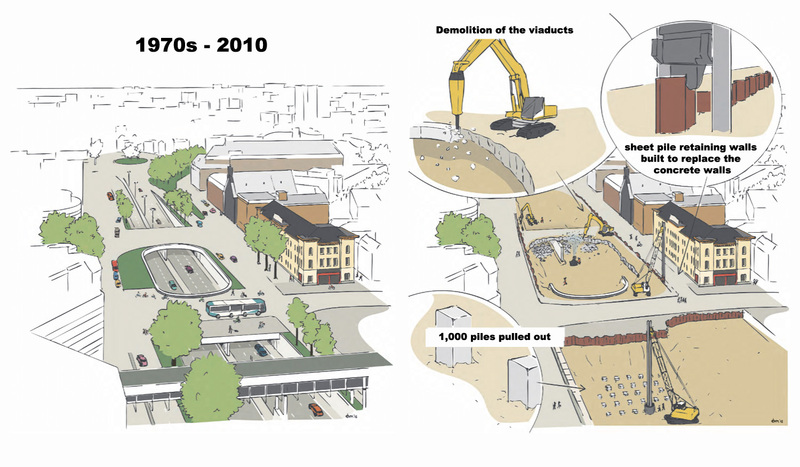 Already in 1970 a pressure group was started with the aim to restore livability in the historic Utrecht city centre. Soon followed by a group called “Utrecht weer omsingeld” (Utrecht surrounded by its city moat again) that fought to open up the canal again. It took until 1989 before these groups were finally heard by a ruling council. That year the city agreed to investigate the feasibility of reopening the canal. The proponents said it would lead to a more livable city and more jobs. It took another ten years, but in 1999 the Utrecht city council finally decided that it would indeed restore the historic city moat. The North part of the filled-in canal was never turned into a road, the space had been used as a parking lot for almost 30 years. So that was perfect for a trial. A bridge was built where a roundabout had taken the place of the original bridge, quays were restored and trees were planted. In January 2002 the new canal was connected to the remaining city moat and water flowed into it. It was very successful in the sense that most people in Utrecht loved it. This part of the city moat returned in January 2002. The trees have grown in 14 years and you wouldn’t know that this had been a parking lot for almost 30 years (1970/2000). In the 1960s the construction of the motorway had been part of a reconstruction and modernisation of the railway station area. Interestingly enough the return of the water is also part of a modernisation of the railway station area. Views on traffic have changed a lot. Not that cars are fully banned now, there are still roads leading to the city centre, but they don’t have so many lanes anymore. Especially diverting through traffic has proven to be a very effective measure to reduce traffic volumes. Private motor traffic is no longer the dominant form of traffic, but it is still possible to reach most of the city by car. What does happen in many Dutch cities is that space that was allocated to motor traffic is now (going to be) used for other forms of traffic (public transport, cycling and walking) or it is used for place making. Space is now allocated to outdoor cafés, other seating areas, green, water, et cetera. In March 2010 the motorway at the bottom of the former moat was closed to all traffic. All the concrete was removed; first the viaducts and then the walls. To keep the ground in place new permanent sheet pile retaining walls had to be constructed (mostly underground and invisible in the end). The pipe that held the water from the original canal was also demolished, after temporary pipes were placed first to divert the water. When everything was taken out the original quay walls suddenly reappeared. The road had been narrower than the old canal. This meant some archaeological investigations could also be done. All the drilled piles that had kept the road in place were now pulled out again. They couldn’t stay in the ground because the city had decided something new under the new water had to be built. There had been a parking garage under the adjacent Vredenburg square. The entrances to that garage were in a location that motor traffic will no longer be able to reach because it will be on the wrong side of the new canal. So the new entrances were planned about 100 metres away on the other side of the new canal. 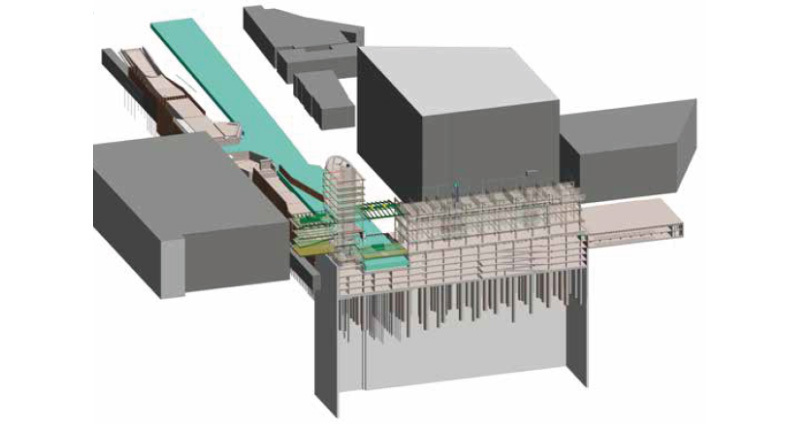 Tunnels under the new water will lead motor traffic to the expanded parking garage. Expanded in such a way that it will even be under the new canal partly. Five floors deep and with room for about 1,300 cars. There is also a ramp for trucks to enter a huge garage under the new music theatre. So unloading trucks with instruments or other things needed for performances does not have to take place on street level in future. To have time to build this project and all the new bridges, the hole that was there after the concrete was all taken out was filled with sand for several years. The situation in 2011 shortly after one viaduct was taken down. The concrete walls are still standing here. But all the concrete you see in this picture was later taken out as well. A cross-section of the water and the surrounding buildings. This picture shows the part that is not finished yet in the foreground, with the parking garage of which three floors down are actually built right under the new water. The entrance tunnel to this garage (mostly parallel to the water) ends in the top left of the picture where the street entrance is. Picture by the building corporation. It was only late October 2015 that the digging really started. But since it was now only dirt it went really fast to get it all away in 3,300 truckloads. Meanwhile trees were planted, that were grown for this project in a nursery in Brabant. The edges of the canal were placed and the quay walls were finished. In just a two months the entire 30 metre wide canal seemed to simply emerge again. On the 16th of December the last sand ridge was taken out and the water flowed again. On the 18th of December the alderman for the redevelopment of the station area opened the canal, or better, he had two little girls do it for him. The canal is not entirely finished. The part that runs on top of the underground parking garage and its entrance tunnels will be opened later in 2016 or early 2017. Then there are still a few hundred metres missing. There are no funds yet for the reconstruction of that part. Seeing how the reactions are to this part of the canal, the city really has no other choice than to find the couple of millions of euros to also finish that last part of the canal. The intention is certainly there. The last bridge that is needed has already been constructed. Connecting the also reconstructed Mariaplaats that new bridge is called ‘Marga Klompébrug’ after the first female Dutch minister who prevented that the entire city moat of Utrecht was removed in 1966 and by doing that she eventually completely saved it. The most southern part of the former motorway is still there in 2016. It is bricked up but funds still have to be found to be able to take this part out as well and to make this exactly as it was. It is expected that this will happen in the years between now and 2019. The removal of the motorway is perfectly in line with the new Utrecht policies that determine that the main road users in the city are people cycling and walking, not people using private cars. 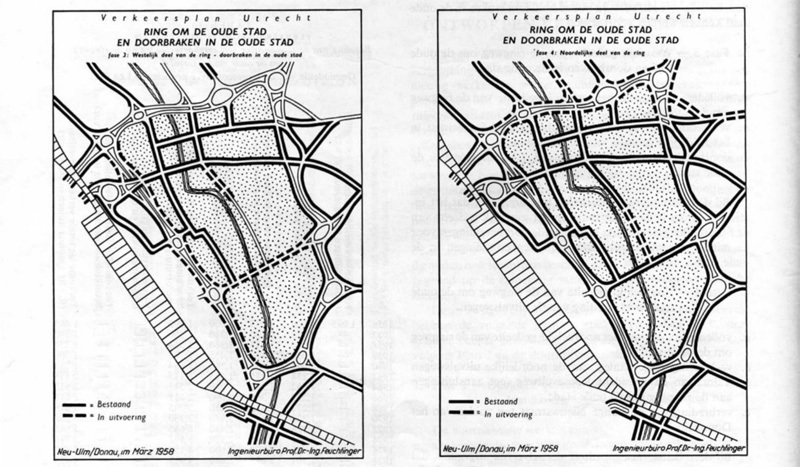 The removal of this motorway was started much earlier than these policies came into effect, but they demonstrate perfectly that there is a new way of looking at private motor traffic in The Netherlands in general and in Utrecht in particular. The space in the city is not there for the flow of motor traffic, but for people living their lives. This was a great information about the resolving of issue permanently in a car during driving easily by using the service of Victoria car removal in Melbourne with in a short period of time a start your journey safe and fast without any trouble shoot ,If your car is still running before you sell it to the junkyard due to any kind of issue then you must use the service of car removal in Melbourne , you might want to use up the gasoline in the tank before you have it towed away. Depending on the size of the tank in your car or truck, the value of the gasoline in the tank can represent a substantial portion of the total value of the price you’re getting from the junkyard. If your car isn’t running, be careful if you attempt to siphon gasoline from the tank. Use only approved containers to carry the gasoline, and never start a siphon using your mouth. Don’t worry about the value of the gas to the junkyard. They’ll have to drain all the fluids out of your car before recycling or scrapping the parts, and gasoline in the tank is a nuisance for them. Fascinating. I love Utrecht and can’t wait to see the finished project. Thank you for taking the time to explain the progress and plans so thoroughly. Excellent piece, thanks for posting this. This will be the basis of an article in World Wide Waterways, the magazine of Inland Waterways International. I always find it very sad to see a city that has sacrificed a beautiful riverside, lake side or seaside to a great big motorway. The Netherlands is not without blame in that, see for instance Deventer. But these places can be found all over the world, where a beautiful shoreline is basically inaccessible to the people who live there, because of the fast traffic alongside it. What study has been given to the concept of motorways hidden in box tunnels beneath such waterways? So amazing to see somewhere reducing car space in favour of the environment. Sadly the only answers many in UK see to car problems is more and bigger roads. Thank you so very much for this fascinating history lesson. 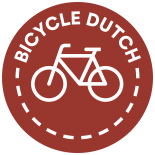 Hooray for Utrecht. I wish Leeds would do this with its inner ring road. Well, not turn it into a canal, but remove it so that through traffic goes round the city, not through the middle. Note that “in tact” should be “intact” (one word). Other than that, I continue to be amazed at how Dutch people speak such excellent English… better than quite a few English people, sadly. Excellent video as always! Reestablishing the canal is an amazing victory. Congratulations! You provide a superb visual experience. I watch it every week. Keep it up! 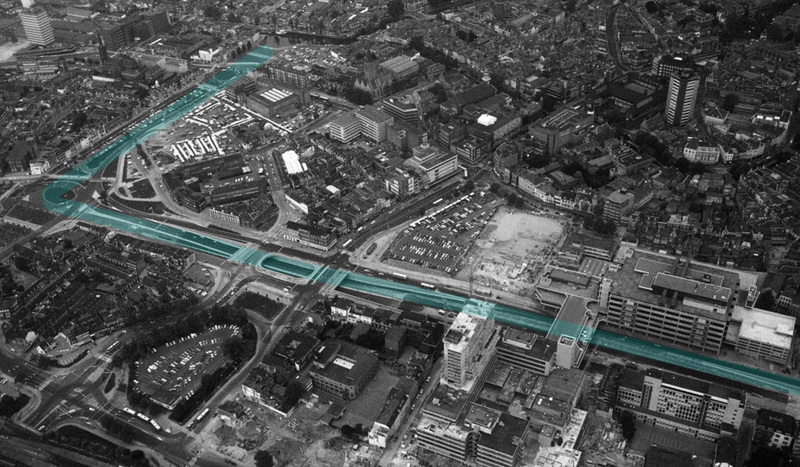 Oh how terrible Utrecht would have been had that 60s motorway network had been built. And I am pretty sure Den Bosch also had a plan like that too. We have to ask ourselves: What were we thinking?! My city also had a plan for a system of motorways around the city centre and leading out in a radial pattern. You can still see remnants of it today. Not much was built thankfully, but unfortunately the only interchange built was in a beautiful river valley. No really good solutions to the monster have been found. Another three huge arterial roads were built to freeway standard widths and lane widths with shoulders, one of then is now a 60 km/h road, the other two are 70 limited roads. I think they were designed with a speed of 100 km/h in mind. There are some places where these big through roads and motorways are useful but they cannot create barriers, be too close to the city centre or be too intrusive on homes, shops or natural areas. They also must be solely for the task of high speed high flow, plus it must be routed to take traffic out of downtowns, city centres, and neighbourhoods. A 100 km/h two lane autoweg bypassing a small city is fine, a 70 km/h ring road is fine, an 80 km/h road to bypass a village is good, an 80 km/h freeway through downtown is not fine. I would like to see how bypasses of smaller towns, compared with the original route after being upgrades by making it smaller, works. 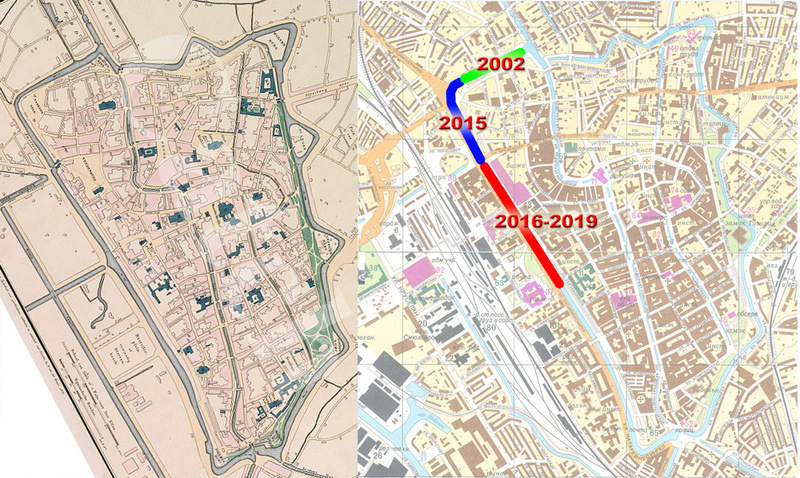 This entry was posted on 5 January 2016 by Bicycle Dutch in Original posts and tagged before and after, history, Motorway, urban design, Utrecht.